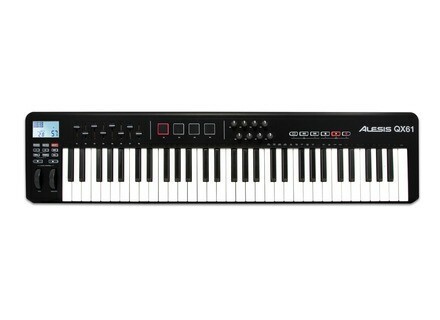 QX61, 61-Key MIDI Keyboard from Alesis. Alesis introduces the Q61, QX61 and QX25 USB MIDI keyboard controllers. Alesis will unveil the trio of new controllers at booth #6400 of the 2012 NAMM Show from January 19-22 in Anaheim, California. Each controller features USB MIDI for connection to Mac, PC, iOS devices* and traditional MIDI hardware modules, samplers and synthesizers. The Q61 is a 61-note keyboard controller that works with music software and MIDI hardware devices. The Q61 offers a five-octave range of expression in a portable controller, built for the studio or stage. An array of controls is onboard, including pitch and modulation wheels, octave up and down buttons, an assignable data slider, and the ability to send program changes from the keys. The QX25 and QX61 are 25-note and 61-note keyboard controllers, respectively. Both controllers enable musicians to punch out a drumbeat on pads, open up a filter with knobs, or adjust volume and playback of sequencing software with faders and buttons. The Q61, QX25 and QX61 will be available in Q2-2012 from musical instrument and pro audio retailers with MSRPs of £ 74.99 (QX25), £ 99.99 (Q61), and £ 129.99 (QX61). [NAMM] Roland PK-6 Roland announces the new PK-6 Dynamic Pedalboard, a MIDI controller successor to the PK-5A. [NAMM] Roland DT-1 V-Drums Tutor Roland announces the DT-1 V-Drums Tutor, a new drum lesson software application for all V-Drums users.